Cyprus Credit Union is excited to announce the arrival of Chip Card technology to our VISA debit & credit cards. This new style of card is easy to use and more secure against potential fraud. Instead of swiping, you will now place your card into the terminal, face up, and leave it there throughout the transaction. Then, like usual, you will either sign a receipt or use your PIN to complete the transaction. If the merchant doesn’t have an chip card compatible terminal, no worries, you can still swipe your card to pay as you always have. Remember to take your card with you when you're finished. Here some commonly asked questions regarding the new chip card technology. Whenever you use your card at a chip-activated terminal, the embedded chip generates a one-time use code. This code is virtually impossible to counterfeit and helps reduce in-store fraud. WHERE CAN I USE A CHIP CARD? You can use your card at any place that accepts VISA credit cards. For the time being, yes. 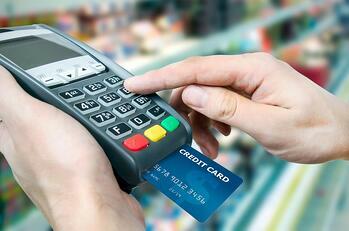 If a merchant is not yet chip-activated, but still accepts VISA, you can continue to swipe your card. In time, using the chip technology will be required. WILL I HAVE TO PAY FEES FOR MY CHIP CARD? No. There are no additional fees to use a chip card. New cards are currently being sent to our members whose cards expire between August & December 2016. All new cards and reissued cards from this point forward will come with chip technology. Once you receive your new card, you will be directed on how to activate it. Remember to call from the primary number associated with your account when doing so. You can check what this is in home banking. During the activation, you will be asked to provide the last four numbers of your social security number. After the card is activated, you can begin using it immediately and discard the old one. Any automatic bill pays that go to that card will then need to be updated with the new card’s information. If you have any other questions or concerns, please feel free to stop by any of our branch locations or call card services at (801) 260-7600.